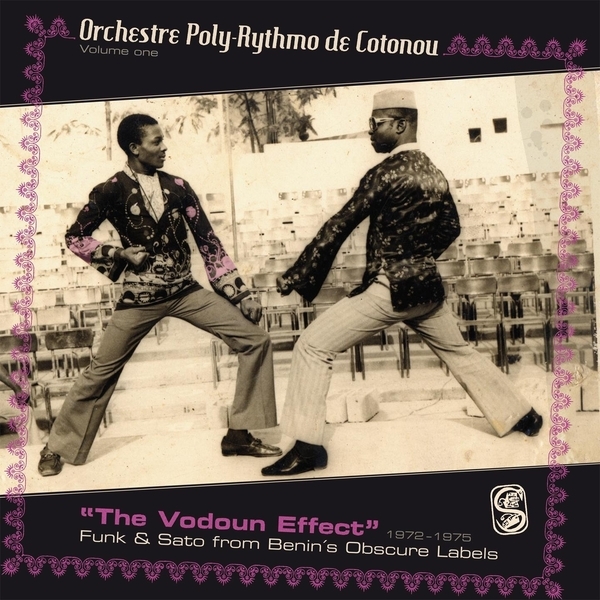 Analog Africa presents the first of two volumes covering the output of Benin's Orchestre Poly-Rythmo de Cotonou. This, the first, covers licensed Funk and Sato (an energetic rhythm performed using an immense vertical drum) from 1972-1975 recorded for an array of small and obscure labels based around Cotonou, Benin's largest city, and Porto Novo, the capital city of Benin Republic. All of these labels were run by genuine music enthusiasts making do with limited budgets and a Nagra reel-to-reel tape recorder operated by Kineffo Michel, a sound engineer from the national radio station, usually recording in private home with only one or two microphones. The music is heavily informed by Beninese traditional music and the spiritual rituals of Vodoun (Voodoo to any Westerners), a religion which worships over 250 sacred divinities. The complex polyrhythms of their music has had a profound impact beyond their locale, influencing rhythms from Jazz, Blues, Cuban and Brazilian music, and it's easy to hear how. With the exception of one track 'Mawa Mon Nou Mio', none of these tracks have been distributed outside of Benin before. Recommended!